Funeral services for Goldie LeVally will be held at 1:00 PM Tuesday, December 4, 2018 at Price - McElroy Funeral Home in Mt. Victory with Pastor Cory Savage officiating. Burial will follow in Ridgeway Cemetery. Friends may call 2 hours prior to the service at the Funeral Home. She died at 2:30 PM on Thursday, November 29, 2018 at her daughters residence. 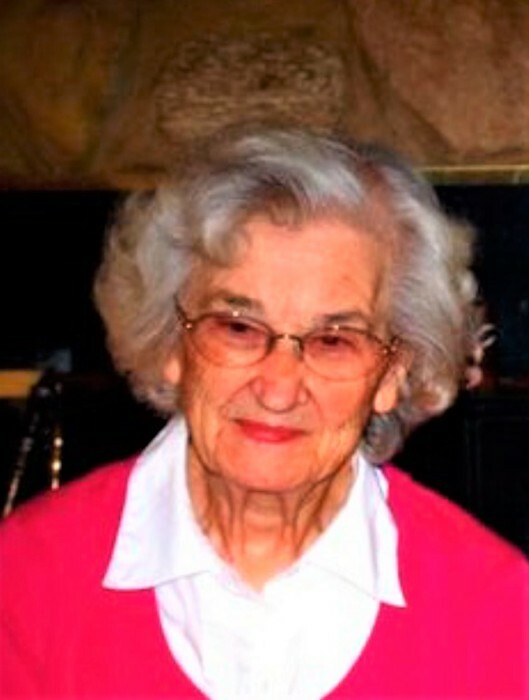 She was born on November 12, 1926 in Floyd Co. Kentucky to the late Alec and Martha (Hicks) Prater. On April 30, 1949 she married Forest Waldo LeVally and he preceded her in death on October 28, 2018. Surviving are 2 daughters; Diana (Mike) Britton of Kenton and Pam McClain of Ada. 1 son; Doug (Karen) LeVally of Ridgeway, 13 Grandchildren, 35 Great Grandchildren, 12 Great-Great Grandchildren and numerous nieces and nephews. She was preceded in death by 3 sisters; Girlie Hicks, Nervie Rorhbaugh and Pearlie Hicks. Goldie was a member of the Ridgeway Church of Christ. She enjoyed fishing, camping and doing crafts. Goldie and her late husband would attend as many Ridgemont sporting events that they could, and everyone in the community knew she had an open door policy at her home. She loved people and to have them in her home, especially during the holidays. Memorial donations maybe made to The Ridgemont Activities Fund.